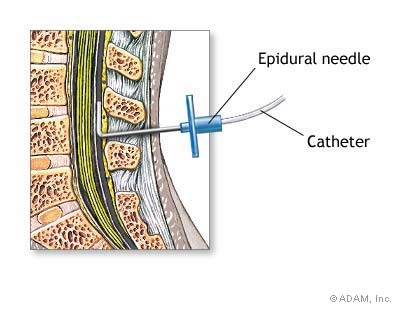 This injection is given to control back pain and contains a combination of local anaesthetic and a low dose steroid. The steroid acts locally and does not have any harmful effects. The injected medication bathes the lower end of the spinal nerves and helps to control your back pain. You will be given this injection under local anaesthetic and apart from a slight discomfort you should not feel any significant pain. The injection is administered with you sitting up. You may find some cold sensation down the legs as the injection is given and this sensation is temporary. Following the injection you will be kept in the theatre recovery suite until you feel well enough to get up and walk. You will be discharged after passing urine. You may experience a slight headache but this should quickly get better and you should be able to drive in a day or two. The complication of this injection in addition to the above may include infection however this is very rare. The benefits of this injection are variable and if short lived can be repeated.